Coywolves and Coyotes are beautiful! Before I begin, I have to comment on one of the submissions here that had me laughing! As I too would say that running into Coyotes after 10 in parts of Oshawa would be the least of my worries too. lol. Though I've had some questionable and perhaps unsettling encounters with the larger species called the Coywolf here in Oshawa (directly across from the Oshawa Centre), I still have to admit my absolute love for these guys. They keep our feral cat population down, since certain 'human' residents think it's respectful to their fellow neighbours to keep these populations going. Yet ironically, you're more likely to suffer injury from one of these feral cats than the Coyote, not to mention the nasty infection causing repercussions to follow should you be scratched by one of these vermin. However, just to be fair to these nasty-garden pooing-quiet spring night ruining, rabbit and native bird killing-basta@*s, I have had the poopers scared out of me on a couple occasions on encounters with the Coywolf. Yes, they DO exist to any naysayers reading these posts. Coyotes usually come in at 40 plus pounds and Coywolves can easily top a larger German Shepherd up to 80-90 plus pounds. Thanks to mankind nearly hunting Wolves to extinction because of unnecessary fear, WE have created the Coywolf by leaving just one small pack of living Wolves in Algonquin that eventually bred with our Eastern coyote. Instead of the usual enemy these Wolves would have once treated these invaders, out of desperation and changed behaviours, they bred instead. Though I'm not your neighborhood Wikipedia, so you can look up my claims. We work nights in my household and I happened to let my small dog, my large king Shepherd and a puppy Shepherd I had been babysitting, out for some exercise around the yard late one night and when I came back out to see what they were up to, I was shockingly welcomed by a 4th large dog standing nose to nose with my full grown large Shepherd. Well I guess snout to snout ;) but anyway, my instant and obvious NAIVE reaction was to look for this 'dogs' owner down the sidewalk. I remember thinking why someone could be so irresponsible as to let such a large (though seemingly friendly) dog off leash. Upon finding no one anywhere in sight I looked back at my new dog friend to ask him where he came from and I got as far as "Oh hey buddy where's your..." followed by the awful lonely and scary as poop feeling of, "Sh@t! That ain't no dog" and more instinctual swearing. imagine what this animal must've thought of my behaviour) I called my two trained dogs in, but when I turned back to retrieve the puppy I was babysitting, I realized that I'd have to bend almost under this 90 lb Coywolf to get him off his leash I had only him on because he was just a pup that couldn't be completely trusted. So I will admit to all you strangers that I did contemplate leaving him. Not my finest moment obviously. Anyhow, I promptly returned armed with a hunting knife and a Butcher knife in each hand while I shouted and threatened and attempted to scare him off with postures and pouncing. All I got was a head tilt. After further threats he backed up a couple feet. I retrieved the puppy and when I came back outside with renewed courage in these "weapons", I found him slowly leaving my driveway. I grabbed my roommate and we attempted to scare him off in our trucks. We each drove a large SUV and the vehicles seemed to startle him a bit, but once he reached the field at our dead end, he just turned to face our headlights and sat down and stared at us! Without really any fear. There were several stories in the neighbourhood of him 'stalking' only people with dogs and it seemed and upon reviewing all of his actions or lack of and mine that night and those of the stories from neighbours, it seemed he was a juvenile who was just curious about dogs. He never hurt any of us and never acted as though he would. Sadly we were the ones over reacting and more sadly, upon repeated calls from a couple residents, he was 'dispatched'. I regret this most of all and oddly, I think I even miss him. He was large, majestic even, curious and most importantly, he was nature. To the posts earlier, yes they can and do survive quite well in our cities and we too have possums and other wild animals you'd least expect and remember I live off Stevenson Rd across from Durham's largest mall! But we also have wild rabbits and thanks to irresponsible pet owners we have feral cats too which seem to be the purr-fect prey for our coyotes and Coywolf friends! In summary, don't overreact where ever you can and try appreciating and maybe even respecting their place in the chain of life because it'll be your fear (unfounded most of the time or not) that'll ultimately see him killed. Thank you Tina, for your well written article, which we are most happy to publish! 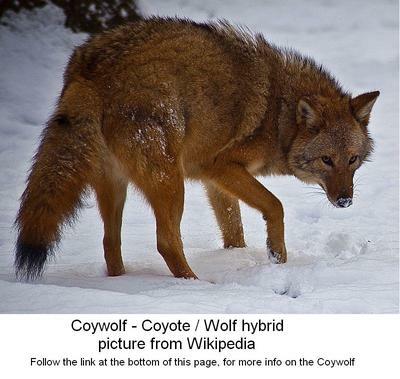 Here is a link to Wikipedia information about the Coywolf in North America.